Roman civilization began not in the more fertile southeast of Italy, but in the more challenging south-central area near Rome itself. We have met the concept that civilizations flourish not in ideal circumstances, but moderately challenging ones, as in other civilizations like Egypt. We noted that unlike Greece, Italy favored more agriculture. 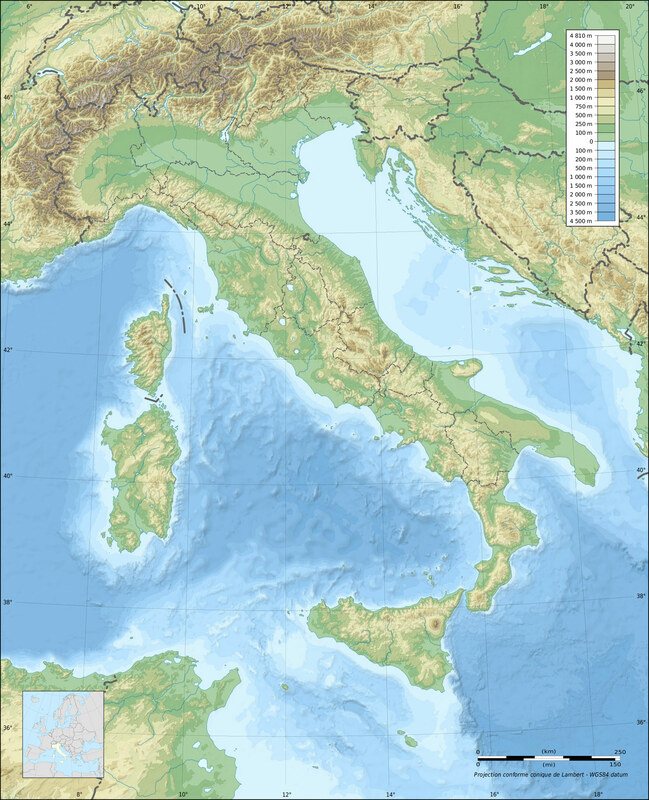 While Italy is a peninsula and never too far from water, it has a fairly even coastline without many ports. The best ports are in the southeast, but Rome did not get there until nearly five centuries of its history had elapsed. By that time, Rome had a thoroughly rural bent to their way of life. If one stands in Rome, it seems the land tended to run downhill in a north-eastern direction. If true, even slightly, this may help explain why Rome’s conquests ran initially towards that direction. This in turn meant that Rome would not have any significant interaction with the naval oriented cultures of Greece and Carthage until around 300 B.C. So, while Greece and Rome would inevitably share certain similarities due in part to their common geography, Rome developed along different lines than Greece in the early part of its history. This agricultural bent of Rome shaped their civilization in ways similar to other agriculturally oriented areas, like Egypt. Just like rural cultures today, Rome based much of their way of life around tradition, the past, routine, and practicality. Both urban and rural cultures have strengths, but a key question for Rome would how they would react when they did interact with the more cosmopolitan Mediterranean. When it comes, this clash will determine the fate of Rome, Greece, and Carthage. As Rome conquered others, they could not avoid confronting the possibility of changing their own identity. We likened Rome to a young farm boy (we’ll call him ‘Jim’)who goes off to New York City for college, and postulated three different outcomes. Benign Awkwardness — Jim doesn’t really fit in city life, and knows it. He try particularly hard to fit in either, and soon wearies of his clumsy attempts. He keeps his rural identity, plugs along more or less alone at school, goes home on weekends, and returns home after graduation. A Happy Medium — Here Jim keeps his roots, but also approaches NYC with an open mind. He learns to see the good and bad of both city and rural life, and picks and chooses from both like a cafeteria menu. The experience changes Jim, but he learns to enjoy both environments without changing who he fundamentally is. This ideal reaction, however, is probably the least likely of the three possibilities I list here. Drink from the Fire hose — Jim becomes completely enamored with his new surroundings. He chucks his rural identity and jumps in with both feet into city life. Tragically, he doesn’t even manage to attach an urban identity to himself. He so obviously ‘tries too hard’ that he fails to find acceptance, and this rejection only makes him try harder. His actions leave him with no identity at all. How Rome faces this challenge will be the subject of our study in the weeks to come. Next week we will look at Roman religion and the extreme emphasis on the practical over the theoretical. Again, it will help us if we remember that Rome was a nation of farmers, who often have little use for theory and speculation, and who focus on soil, crops, and so on. Ancient chroniclers agree that the Romans were a religious people, unlike the Greeks. But their sense of religion was also much different than in Egypt, for example, another ancient “religious” people. In Egypt, their beliefs filtered down into the government, architecture, and where they lived. Their literature is filled with stories of the gods. They wrote psalms/hymns of praise to their gods. We see nothing like this in Rome. The Romans had devotion to their religious duties, but they saw “religion” usually in terms of “checking off the box.” They would do what they needed to do, but rarely did their religion touch their souls, and a variety of stories from their past illustrate this. Machiavelli recounts a story from Livy, where a Roman general wanted to attack the enemy, which I recount below. . . The consul Papirius, in conducting a war against the Samnites, [saw a favorable moment to fight], and ordered that the priests take the auspices. The birds, however, did not eat. But the chief priest, seeing the great desire of the army to fight, and their confidence in victory, reported to the consul that the auspices were in fact favorable. But one of the assistant priests told the consul that the chief priest lied. . . . And so the consul put the Chief Priest in the front ranks of the army, and it happened by chance that a Roman arrow struck the chief priest, whereupon he died. When Papirius heard this, he declared that whatever wrath the gods felt toward them had been appeased, and thus by apparently to accommodate his designs to the auspices, Papirius gave battle without giving the appearance of neglecting his religious duty. According to the Romans, not at all. He did his duty. He took the sacrifices. A priest told him that the gods approved. And they won. Machiavelli relates another story. . .
Appius Pulcher acted just the contrary way in Sicily during the first Punic war; for wishing to fight the Carthaginian army, he caused the priests to take the auspices, and when they reported that they did not eat, he said, “Then let us see whether or not they drink,” and threw the birds into the sea. He then went into battle and was defeated, for which he was punished in Rome. The historian Livy goes on to say that Pulcher was not punished for losing, but for his brazen impiety. Paprius “kept up appearances,” whereas Pulcher did not. But I have doubts. If Pulcher had won the battle, would he have been punished? What these stories show, I think, is that Rome really worshipped Rome itself. All things bowed to glory of Rome. Was then their religion a mere smokescreen? We know, for example, that Roman religion technically forbade offensive war of any kind, yet they became one of the greatest conquering empires they world has ever known. Something it seems, gave at some point.